Wednesday August 11th 1926 I worked on rug. The girls busy with their own affairs. Letter from Ida. Wrote her as well as Hattie & Fannie. Mr Haskins here in PM. Very hot. Thursday August 12th 1926 I put in some time on rug. It rained in AM But Edith did washing. I slept awhile in PM. Wrote L D L. Spent evening reading Iowa City papers. Friday August 13th 1926 It rained in AM. I did a lot of work on rug. Slept in PM. The girls had callers. Evening on porch. Saturday August 14th 1926 I worked on rug till two oclock. Wrote Edith Whetstone and Mable McDougall. Laura and I went to the up town. Mr Alt brought us home after supper. Sunday August 15th 1926 Laura went to S S. I met her at Baptist church. After dinner she and Lydia rode with The Alts & Edith went away. I read some and later went to ride with Will Duncan. The Falklers here in eve. 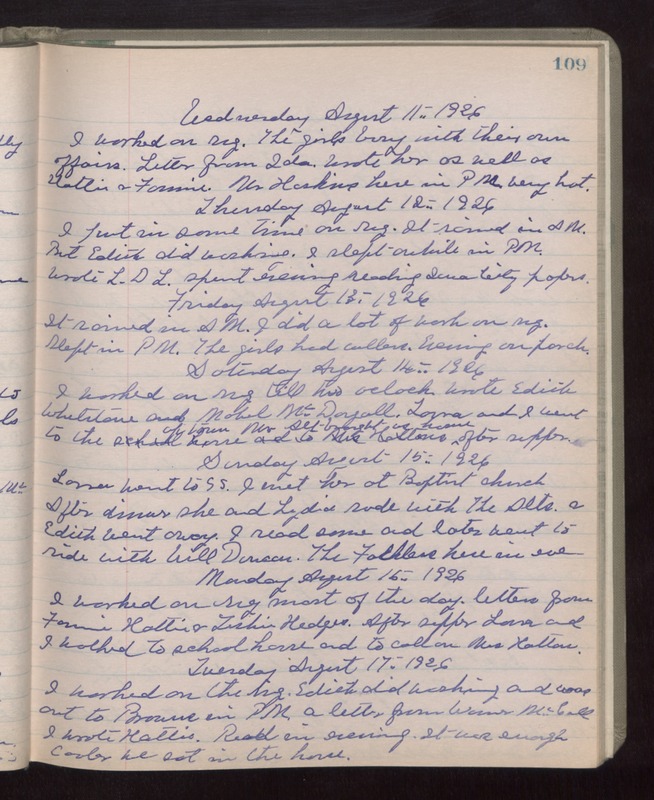 Monday August 16th 1926 I worked on rug most of the day. Letters from Fannie, Hattie & Tishie Hedges. After supper Laura and I walked to school house and to call on Mrs Hatters. Tuesday August 17th 1925 I worked on the rug. Edith did washing and was out to Browns in PM. A letter from Warner McCall. I wrote Hattie. Read in evening. It was enough cooler we sat on the house.